2. Do they cost much in stores [if they can be bought in stores]? 3. How is it used? I saw the pic on Ebay [or W/e] and there was a cord that goes... where? 1. You can simply copy and paste the code. 2. In some places you can get one for 20 dollars, but usually not exceeding that. 3. You put it into your DS and then place the game into the slot... The cord is so you can plug it into your computer and update it. The cord also allows you to put your own codes into it. Wait is the all TM's cheat dangerous? If you use the code from CodeJunkies, then it is dangerous. The TM's themselves are not dangerous, the code is just very retarded. I recommend using the Pokesav version. This is probably the code I use most often: the wild pokemon modifier. To use this cheat, press L&R on the overworld. This gives you 493 Master Balls in the first slot of your ITEM bag (not your ball bag). In order to select the pokemon you want, toss master balls until the number you have equals the NATIONAL dex number of the pokemon you desire. For example, if I wanted a Mew, I'd toss out 342 master balls so I'd have 151 left. Now go to any area where wild pokemon are found and press the L button only. You'll encounter the pokemon selected about 95% of the time at the level of the usual pokemon found there. 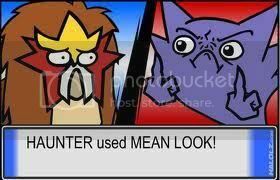 Press L&R again to reset the number of master balls you have. Oh, and if you feel like using the master balls to catch pokemon, it's not a problem. The number doesn't diminish with use, only by tossing them out. This is really useful for getting pokemon at pretty much whatever level you want. Hope it helps! the site said x is the variable. Last edited by Jeneus on Tue Aug 05, 2008 5:30 pm, edited 2 times in total. Do I have to upload Pokesav to make the codes work or just copy and paste on the AR? You don't need to upload anything. You use Pokemod to create what you want, then you export them as AR codes. When you make the codes you can open them in Notepad, select the code for your version and then paste it into the Action Replay. Last edited by Lobsel-Vith on Wed Aug 06, 2008 8:36 pm, edited 1 time in total. Shouldn't you have learned that at shool or something? I learned it in 3rd grade (I think) in that computer apps class. I don't remember the name. Man, that was a long time ago. ...you know how to highlight words, right? You click and hold the button, then you drag it across the word/ line. The words/ whatever should now be in a different color, like white, black, blue, etc. Then you right click the words/ line and there should be a white box of options. Click "copy". Then go to the place you want to paste. Right click "paste". It should now be there. These are just simple computer operations. You don't need AR for it. You can copy and paste pretty much anything. I mean from the computer to the AR. I thought I heard someone say that... Maybe I was wrong. I should also mention that these can be used as much as you want, but make sure you only activate one at a time. This is the movie Manaphy given away at ToysRUs on 09/29/07. This is the movie Darkrai given away at ToysRUs on 05/31/08. This is the Deoxys given away at GameStop on 06/21/08. This is the Movie Regigigas given away on 06/20/08. This is the Movie Shaymin given away on 07/19/08. Keep in mind that the regigigas is the one that is necessary to open the cavern in platinum. I should have made note about the Regigigas... Perhaps if I just gave the link, but I did give the credits. Then turned of the DS after testing to enter in another one. When I turned it back on, all games and codes had been erased. i don't have windows, so i can restore anything automatically. What should i do? Well, I have some more codes! These are re-battle codes, and they work for me. These were originally for Diamond version, but they work for both versions. To use these, you should activate them before you enter the area of which they are stationed... I was advised to do this, but I don't know why. Last edited by Lobsel-Vith on Sun Aug 24, 2008 6:37 pm, edited 1 time in total. That's so the Pokemon sprite will appear, otherwise, there will be invisible Dawns and professors forcing you to battle an invisible Dialga/Palkia. When the battle starts, it'll just be a blank screen forever, until you shut off your game of course. I'm not sure what would happen if you save your game after you use the cheat, but before you face off against invisible Dialga/Palkia. Either 1. You're stuck, where you can never leave 2. Cheat deactivates. Anybody willing to test? I already linked those rebattle cheats in an earlier post. Anyway, the Heatran rebattle doesn't work; you just see the scene where that red-head boy takes the magma stone (actually, it'll just be a rock sitting there). As for the trios, I heard that Mesprit won't appear, but I once found one randomly after I used the cheat (it was so unexpected). I suppose it won't show up on the radar thing? Or maybe it was luck? As for Cress/Giratina codes, I heard it doesn't work either, or it doesn't work most of the time...something like that. I haven't heard anything wrong from Regigigas and Rotom, so they may be okay. No, no - thats Heatran. There is no reliable heatran rebattle code. Huh that's weird. I haven't encountered any problems with these codes, so I'll keep testing them I guess. The heatran one doesn't work. I tested it, it just makes you do that entire sidequest with that red-headed kid... He even returned it but no Heatran. The Cresselia (gives another lunar wing) and Giratina ones WORK. You can even see Cresselia on that little map thing so one can track her; this is the same case with Mespirit. One can also get the other 2 of the trio... The Rotom and Regigigas Work as well. The only one that doesn't work is the Heatran. I tested them. they all work perfectly fine. Oh, thanks. xP Forgot all about that. With the "Wild pokemon are shiny" code, do the pokemon stay permantly shiny? Like say you turn off the cheat or take your AR out are they still shiny? And say you trade it to somone, do they see it shiny? Not sure about trading, but if you disable the cheat then the pokes you caught in shiny form will become unshiny. Yes, it is almost as if it IS shiny. So the other person will. Also, there's now a code that makes them undetectable if they're hacked by changing PIDs to shiny PIDs. ActionReplayCodeManager.exe has encountered a problem and needs to close. EDIT: nevermind, i got the rotten thing to finally work. in addition to that, anyone interested in tons of free berries? as usual, press L+R to activate. Depends on which shiny code you use; if you use "wild pokemon are shiny", then they're permanently shiny. If you use "All Pokemon shiny (in box and pc, party, wild)", then it's not permanent; turn it off, turn your game back on and it'll be normal again. I'm not sure I grasp the usefulness of this. Care to elaborate/give us the code? How were they detectable in the first place? I don't think they're even detectable in the first place, unless maybe if you Pokesav them (possibly because someone might've not added the secret ID, of course, I don't know much about bad eggs ). Actually, it gives x995 berries each. It also gives you (randomly) an Explorer Kit in your mail bag. Jeez...of all places. You can erase it if you use the "All mail" cheat. NOTE: I might've mixed up the codes that do this. It's either the "all berry" cheat, or the "all tms" that gives you the unnecessary Explorer Kit. Last edited by Volke on Wed Nov 05, 2008 5:30 pm, edited 1 time in total.